I had a great time at yesterday's Open Coffee Club, where investors, entrepreneurs and wild cards (like myself) came together at AlphaLab for some quality face time. The catch? Although I met 3 or 4 new and interesting people, I spent most of the event talking to folks I already know. Why do so many of us attend "face to face" events and then spend the bulk of the event talking to the same people we knew yesterday? Isn't the entire point of a social event to meet people you wouldn't otherwise have the opportunity to talk with? And yet, when faced with the prospect of cold-contacting a complete stranger -- even at an event where everyone allegedly has multiple overlapping interests and is ostensibly there PRECISELY to make new contacts -- most of us who don't already have an elevator pitch burning up our tongues opt for the woobie of familiarity. * The known payoff from talking with a friend is preferable to the unknown outcome of talking with a complete stranger. Especially at an event where you're not sure what everyone's area of expertise is, and you're afraid you won't be able to extricate yourself from a conversation with someone who offers no direct value (in your opinion). * We have no idea what our true value is. So instead of trying to explain why we think we're valid to a complete stranger (who, we presume, is automatically judging us and comparing our net conversational worth against that of everyone else in the room), we'd rather talk with people whom we already know appreciate us in some capacity. * We have no game plan. Sure, the concept of being surrounded by "interesting people" is alluring, but once we're in the situation, we immediately presume that everyone else who's there has a much more specific agenda. If WE don't, we wouldn't want to waste anyone's time (or our own), so we aim for the low-hanging fruit of familiarity instead. All of this usually results in small clumps of conversations among people who obviously already know each other OR, in a variant, people of a similar age / gender / dress code, who gravitate together because they imagine that they must have something in common. And if you've come to such an event alone and aren't wearing a popularized "uniform," you're probably floating along the fringes, eating the free food and conspicuously pretending to check your text messages, so no one knows you're privately terrified of making contact. * Pre-set one goal. Maybe you want to meet one prospective collaborator. Or bounce a vague idea off 5 people. Or collect 20 business cards. As long as you have a concrete goal, you can focus on accomplishing that first, and then any chatting among your friends won't feel so guilty. * Talk to the loner. Immediately beeline for the nearest person who appears to be floating adrift and engage them directly. As you've probably noticed, small groups tend to be where the loners will eventually wash up anyway, so you might as well cut out the middleman and form your own small group right from the get-go. * Bring people together. Chris Brogan is the master at this, usually because he's swamped with conversations and needs an elegant escape clause. Following his method, start by engaging someone you DON'T know. Find out their story, in a nutshell. Then rope in your nearest friend by asking the new person, "Have you met my friend [NAME] yet?" and physically deposit them in a conversation. This allows you to then step away without leaving the new person alone, which is probably how you found them. NOTE: Dropping the cards in a stack near the coffee cups doesn't qualify as dispensing them. Man up, people. 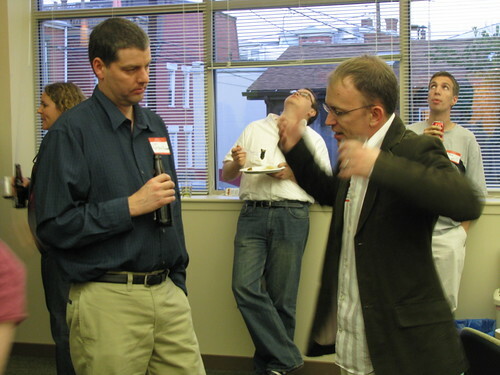 This image of Woycheck trying unsuccessfully to frighten Jim Russell into fleeing was taken at a previous AlphaLab event by Michael Fulk. Gosh, I've missed reading your blog. Used to plug into my Google Reader everyday and would find your updates there, but Twitter has killed my Google Reader habit. Your observations are right on!! Thanks for the tips and encouragement/tips to engage strangers. There are a lot of social media/tech-type party people who go to all of these events in packs. They are unable to function on their own because as an individual, they have no value. I know not everyone is this way and many people succeed on their own. However, there are those people who, if you took them outside of their social sphere and really looked a them, you wouldn't see much and you certainly wouldn't get anything useful from them. They are co-dependent. Thanks for the compliment, Leesa. I'm doing my best to get back on the blogging train, so perhaps you'll see even more of sparkling wit (or what passes for it) in the coming weeks. Oh this is fantastic! Great insight. I struggle with some of my staff's notworking techniques. I will be following your blog now. BTW, what are the two lone wolfs in the background looking up at? Great advice. Here's another one: Station yourself near the bar or food. It's an ever-changing landscape of people, and you'll always have something in common to break the ice, "wow, have you tried the shrimp balls yet?" Ok this is a bit of a shameless plug but it is to the point. I created a networking group specifically to avoid this problem. I was tired of going to events where despite a rich networking environment people were not really interacting and the connections that were made tend to be shallow at best. Simply put at an event where everyone is trying to network to their specific need goal or agenda the interactions become forced. At an ExecTec (www.ExecTec.us) everyone participates in a predetermined round robin discussion of the topic of the week as a table of equals over dinner. This eliminates the hanging with your friends and encourages you really participate with everyone and gives real deep perspective on everyone at the event. Rather then handing out and collecting lots of cards which you may or may not follow up on. You really get to know the other participants. The events are small but the connections made are real and deep even at your first event. We have a dinner in Westwood, CA every Tuesday night so if you are ever in LA on Tuesday please check it out. Yup, this rings true for me too. Timely, in fact, as I'm headed to the Montreal Twestival tonight and, surprise, plan to meet up with friends there. My goal for tonight will be to apply some of your suggestions and see how it affects the outcome of the evening. I'll report back. Love your ideas for staying focused while networking. I do think it's important to mention that you don't want to avoid people that you already know. Networking works best when you strenthen those relationships on an ongoing basis. If you are constantly seeking out only new people, those relationships don't really get a chance to mature. I actually think this illustrates the shortcomings of social media and the tools we use to communicate. Nothing can replace true face-to-face conversation. So when we actually get a chance to have a real talk with someone that we usually only speak with over Twitter for example - we relish in it. I always thought I used techniques like "creating a scene" precisely because I work in an industry where there's not a huge amount of networking so I'm not used to meet'n'greets. Who know I was being savvy? Lots of useful advice - thankee kindly. I'm pretty sure Andy is just looking up to investigate what had me so distracted. The answer is there's a rather fascinating arrangement of beams and slabs supporting the next floor of the building. Fascinating to me, at least. I'll keep your plan in mind, Justin. I think I'm already naturally gifted with making a scene from a familiar group by being really loud. And we've learned you can create a little bit of a scene not saying anything at all. Just stare at the ceiling like a loon. It is my social media albatross. Great points on this, Justin - my previous work experience helped alleviate some of the issues but, honestly, Pittsburgh Bloggers, PodCamp and my current job as made it much easier to mingle with new people. This post is full of great insight. Your tip about coming in with a pre-set goal is crucial to successful networking. It's a great motivator for those of us who tend to be more introverted and stick to people we know at networking events rather than meeting new people. This was my first visit to your blog. Very helpful info. Definitely adding it to my list of regular blogs to check. Thanks for the great post. So true. I will add a reason for not leaving your cards in a stack; a competitor will take them- all of them and throw them away before anyone can grab them. So leaving them is not merely useless, but beyond useless. This blog is the best I've seen, congratulations friend. I found a great deal of helpful information above! I have always wondered the same thing! Very nice site and article. Amazing one, i appreciate this work.... This is a wonderful post Hey I see smart blog.